Cast: Denzel Washington, Russell Crowe, Josh Brolin, Chiwetel Ejiofor, Carla Gugino, Armand Assante, Cuba Gooding Jr.
Story: Real-life drug crime in 1970s New York. Running Time: 2hrs 37 minutes. It's some time through the movie before you realise. Everything's ticking over nicely, Denzel's on top form as usual, playing an enterprising drug baron who's inherited the Harlem empire with Russell Crowe as the lone unbent copper on his tail, but then after about 90 minutes you start to wonder if it's ever going to take off. And it doesn't. I blame Martin Scorsese. We all know his mob movies, specifically last year's "Best Picture" The Departed and so we fall into the groove when we find another one, expecting stand-offs, shootouts and general wise-guy action. 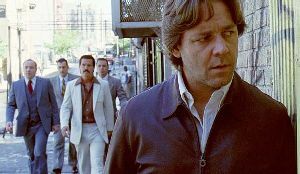 In American Gangster it just doesn't happen - it's a more cerebral and, dare I say it, realistic depiction of a crime lord's life. There's the occasional moment of violence, often pleasingly unexpected, but nowhere near the body count of a Godfather clone. Had I been pre-armed with this information, like you are now, I might've warmed to it a lot more - however as it was I was rather ruing the bladder-testing running time of over two and a half hours. The other area where experience counts against American Gangster is with the appearance of Cuba Gooding Jr. I've never seen what others see in him - when he collected Best Supporting Actor for Jerry Maguire, I couldn't have been more surprised if it had gone to Roland Rat's mate Kevin the Gerbil. Since then he's been in such mainstream comedies as Boat Trip and Rat Race, and I don't think it's unduly harsh to say he was rubbish in all of them. Here he plays a club owner who deals with Denzel and gets shirty when his business practices are questioned. Now, you know when you see a kid trying to be cool and with-it ... like this season's Big Brother when Emily got kicked off for using the N word ... you can't help but laugh at the oblivious patheticness. That's what Cuba Gooding looks like here. He's so tragically bad at being the hard guy that it shatters the illusion - particularly when he's acting against Denzel who's so good at it. Denzel wisely makes his character laugh in an internally patronising way, as if giving a silent signal to the audience that he shares the joke with us, and so the scene actually gets away with it, but really, stop hiring him please. 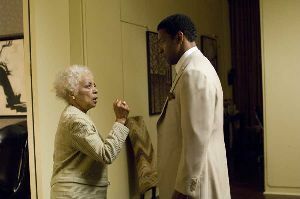 American Gangster has an image problem. Whilst superficially appearing like a Godfather, in reality it's more of a Donnie Brasco. Worth watching, but not for everyone. Testosterone Satisfaction Rating: 3/5 - whilst there's very little action to speak of, there are enough fleeting glimpses of naked female flesh to keep you on your toes. To enjoy this film you should be: aware of its surprisingly action-free nature. American Gangster was released in the UK on 16th November 2007.